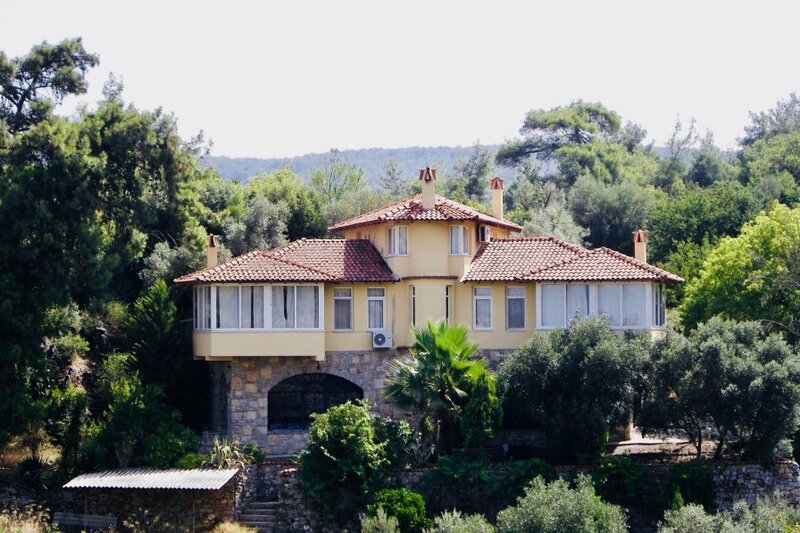 Villa Daisy is located on the South West Coast of Turkey in a village called Citlik, near Akyaka, surrounded by National Trust land. It is just a beautiful place. Our Villa is a large 4 bedrooms detached, with a large swimming pool, nestled up its own private driveway. There is over an acre of land, with olive trees, orange and lemon trees. The villa and pool are totally private and not overlooked by any houses. The views are fantastic. The property has been refurbished, so there will be new furniture and fittings, WiFi, CCTV and a burglar alarm. Akyaka is the nearest beach and village about 5-7 km away. Dramatic mountains rising steeply behind, a gulf of turquoise blue waters with sandy beaches stretching out within Gökova Bay and nestled between the characteristic red-roofed, white-washed houses with intricate pine-timbered eaves and balconies strewn with brilliant pink bougainvilleas -this is Akyaka. Akyaka village became famous for its Mugla style architecture made famous by the award winning architect Nail Cakirhan. The houses are a combination of old Ottoman Empire and Greek style and maintains warmth in the winter and coolness in the summer. The original design has altered since and only retains a residue of the original architecture, nevertheless the village is very pretty. In spite of its recent growth, Akyaka remains both scenically stunning and relatively unspoilt. Many city dwelling Turks have chosen Akyaka for their summer houses and great conservation efforts have been made to ensure that all these buildings are constructed in the traditional Mugla style with pan tiled roofs and intricately carved wooden ceilings and verandas, an interesting contrast to the usual Mediterranean style of architecture. The village has numerous food shops and a village bakery plus a permanent fruit and vegetable market. There is an excellent choice of restaurants ranging from specialist kebab makers and family run restaurants to the slightly more sophisticated riverside restaurants where fresh water trout is offered alongside a selection of delicious bream, bass and mullet. Gökova village is about 5 minutes inland from Akyaka and is the holiday residence of many wealthy Turkish families. A car is essential when renting this property. Although public transport does run along the bottom of the road. Marmaris is a super Turkish holiday resort, with a port and boat rides around the coast. There is plenty of shopping with a large bazaar, where you can find lots of good quality cheap handbags, sports gear particularly football kits for only £10.00. There are also 2 or 3 large european style supermarkets where you can buy almost anything. Wine and beer tend to be at a similar price to the UK. There are also water parks and rides for the children and lots of ice cream. The nearby beach of Akyaka is just 10 minutes or so in the car and is a beach frequented by a lot of Turkish people who have bought villas here. It is really charming and unspoilt. Great beach for children as it is really shallow. Nice walks and childrens play area. Lots of restaurants and shops. Also you can rent sun beds and umbrellas very cheap. The historic resort of Dalyan is only about 25 minutes away by car, where you can see the ruins and take boat rides to the mud baths. The kids will love it. These tend to be all day excursions and good value for money. A very pretty resort. There are also golf courses in the region and lots more being built around Dalaman. Villa Daisy is located on the South West Coast of Turkey in a tranquil village called Citlik. Set high in the mountains, surrounded by National Trust land. This charming 4 bedroom villa has a large swimming pool. It is less than 30 min drive from the most popular holiday resort of Marmaris, while the spectacular Fethiye-Oludeniz is only a one-hour drive away. It is ideally situated for access to beaches, historical sites and various leisure areas as well as a centre for sightseeing. Although car hire is advised to explore the rest of the Turkish Coastline and unspoilt historical hinterland, there are some beautiful local walking areas.